I admit I missed yesterday’s Wednesday Commuteblogging and didn’t have one at all last week. I’ll plead that when the ACP brevets are underway, I try to scale back the late evenings in order to get more sleep and generally focus on the next event. MG and I are tentatively headed south to the N.C. Randonneurs 300K in Raleigh on the 26th, and we’ll return for their 400K on May 17. Our 600K plans are uncertain right now, with the Boston 600K on July 26 the most likely. 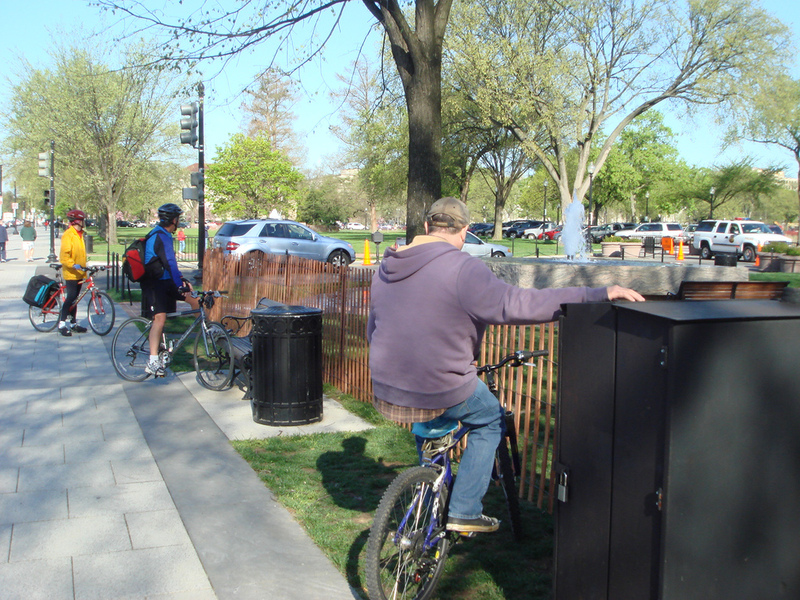 This week Pope Benedict is in D.C. and as a bicycle commuter who rides past the White House daily, I get to see a little more of the pomp of VIP visits than your average person who drives or takes the Metro subway. That was the case Wednesday, when he was hosted at the White House. What’s he got to do with steel bikes? Nothing, really. He probably grew up riding a steel bike. We know he has a wooden bicycle to ride around Rome. On to steel bikes. Randonneurs ride all types of bicycles, with steel, titantium and carbon the top frameset choices these days (did I just list those in reverse order?). Aluminum is relatively rare on brevets, save for Cannondale, which to its credit still offers a touring bike and the most affordable high-quality tandems now that Burley has given up on bikes and focuses on trailers. Richard Schwinn of Waterford Bicycles recently spoke to Georgena Terry of Terry Bicycles about frame materials. Check out the audio interview at Georgena’s t-chatter blog. While he’s a fan of steel (warms my heart! ), Richard notes the qualities of carbon. In particular, he recognizes the ability to shape it into cool lines, and, to him, the value of carbon forks to reduce weight, though he says the non-racer is overly focused on that aspect. He also talks about how carbon’s long-term durability is as yet unknown and how cyclists confuse its ability to dampen, vs. absorb, vibration. We all know carbon fails catastrophically, unlike steel and to a lesser degree titanium. Richard delves into the economics of carbon, as well. China and Taiwan saw an opportunity to win market share through aluminum frames, which they sold cheaply enough to push steel bikes off shop floors, and now are doing the same to aluminum by emphasizing carbon. Over at the Cycloculture Blog, Surly’s Andy Corson offers his take on the Surly lineup. See Andy’s comments Here. Surly offers what I see are the best lower-cost randonneur-ready frames and bikes. They are available through any shop that does business with the big wholesaler Quality Bicycle Products. It helps to look past Surly’s ugly web site, I’ll admit. The problem is that you rarely see Surly bikes in shops, which prefer to push the brands with which they have dealership status. I wish more shops would keep a Long Haul Trucker, Cross-Check and Pacer built up for test rides, just to show folks that affordable, lightweight (note I did not say ultralight) steel bikes are still around. I recently told a buddy who is considering getting back into cycling to check out Surly, but I have no idea if he could actually find one built up for a test ride in his size. Seattle randonneur Paul (Dr. Codfish) Johnson reminds me that another affordable alternative is the Salsa Casseroll. The Casseroll looks great and I’ve mentioned this bike before, but it’s worth repeating. Steel, versatile, room for fenders and 32mm 700c tires. What’s not to love? There is a (relatively) new entry on the scene; If you have not already, check out the Salsa Casserole. This may be the userper to the LHT, (give it a few years) and it is available as a built bike. I wonder if Salsa bikes are seen much on your side of the country? Here we see a fair number of Kogswells built for rando, you might know a little about them eh? Also a good alternative, though the Casseroll is slightly more expensive, but not by a lot. Built bikes on the web right now for under $1,500. I saw one a couple weeks ago built up as a race bike — very versatile! The Kogswell P/R won’t be seen much out here. The one dealer I know that sought to buy a few was unable to place an order, despite trying more than once. It’s more up to the individual to get one direct. I agree that Surly makes a fine bicycle as I’ve ridden a Crosscheck since 2001. I recently upgraded to a Rivendell Custom for Brevets and weekend rides but I still use the CC for my daily commute. It’s always been a solid performer. I’ll be participating in the ROMA Leesburg 400K on 26 APR and working the ROMA Lebanon Church 400K on 3 MAY. Additionally, I’ll ride the ROMA 600K on 17 MAY. Enjoy your Brevets and I hope to see you on the road soon. Interestingly, both Surly and Salsa are owned by QBP here in Minnesota. Soma frames are also worth a look: versatile, attractive, and reasonably priced steel frames. Some even have fancy lugs!